What were some early efforts to explore asteroids and comets with spacecraft? The first flybys of asteroids were achieved by the Galileo spacecraft on its way to Jupiter. In October 1991, the spacecraft flew by Gaspra, and in August 1993 it flew by Ida. These flybys provided the first close images of asteroids; showed that asteroid surfaces are actually quite interesting; and revealed that asteroids could have moons, too—Ida had the asteroid Dactyl for a moon. These flybys helped spur interest in asteroid science, and led to several significant future missions. The first spacecraft to study comets as their primary science mission were sent toward Halley’s Comet. In the worldwide anticipation of Halley’s return to the inner solar system in 1986, a number of nations worked together to send spacecraft to study the comet and its tail. Two Japanese spacecraft, Suisei and Sakigake, and two Soviet spacecraft, Vega 1 and Vega 2, had close flybys with Comet Halley in 1986. NASA and the European Space Agency had launched the ISEE-3 satellite on August 12, 1978, and after its original mission was over, it was renamed the International Cometary Explorer (ICE) and redirected to observe Comet Giacobini-Zinner in 1985 and Halley in 1986. ICE had no cameras, however. The most significant spacecraft to observe Halley was the Giotto mission. 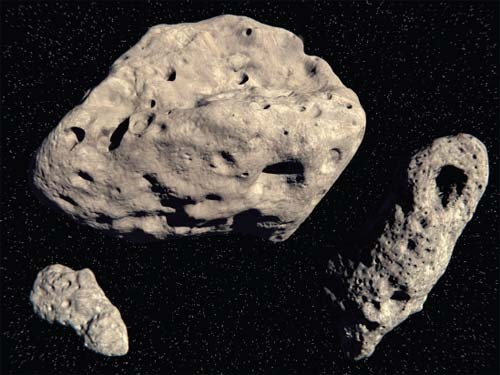 Clockwise from bottom left, the asteroids Ida, Lutetia, and Gaspra. Some asteroids, like Ida, actually have tin orbiting them.